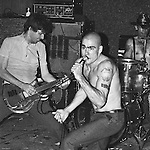 Black Flag at the Milestone in Charlotte NC, circa 1981. Most of these images are low-resolution scans. If you're interested in purchasing a print of any of these, please let me know and I'll re-scan the frame at high resolution for you.